The Contra Costa Sheriff's Department is releasing photos of two suspects who robbed the 7-Eleven on Oak Road in unincorporated Walnut Creek back on October 23. The robbery took place at 1:14 a.m., according to spokesman Jimmy Lee. Two robbers, armed with guns, entered the store and ordered the clerk to the floor. The robbers took some cash and items from the store. It was unknown which direction they fled and whether they used a car to get away. 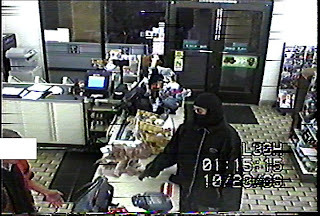 Detectives believe the two may have robbed the same 7-Eleven before. Suspect 1 is described as heavyset hispanic or white male, wearing a black hoodie jacket, white t-shirt and dark blue or grey colored pants. 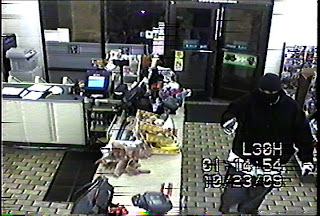 Suspect 2 is is described as a hispanic or white male, wearing a black jacket with a logo on the front, and grey pants. The suspects are considered armed and dangerous. Anyone with any information on their identities is asked to call the Office of the Sheriff at (925) 313-2653.